The Sunday brunch that is part of the opening activities for the Quilts=Art=Quilts exhibit was held at the Springside Inn, which overlooks Owasco Lake. Elin Noble, one of the jurors for the exhibit, was the guest speaker and talked about the jurying process. Back at the exhibit, Pat posed in front of the second quilt she has in the show. This is Priscilla's entry, whose title I believe is "If Leaves Were Blue." Before the start of the Walk About Tour, there was a chance for a little chatting. Here is Donna Lamb, Director, along with Genie Barnes, Executive Consultant for the Museum, and Priscilla. 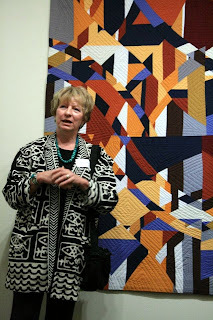 Genie Barnes conducted the Tour and asked each artist to talk a little bit about their quilt. Lindsey's camera caught me in front of my quilt with my mouth open. Looks like a good time, congratulations again.